We are lucky enough to know a friend who loves to fish. This halibut was a gift from him. It was such a beautiful piece of halibut I wanted to make sure it was lightly seasoned . This would also be wonderful barbecued indirectly in foil packets. Enjoy this very healthy recipe with couscous for an easy and delicious meal. Line the bottom of a 9x9 inch baking dish with foil and coat with cooking spray. In a small bowl mix all herbs and spices. Pour the lime juice and sprinkle half of the seasoning on top of fish. 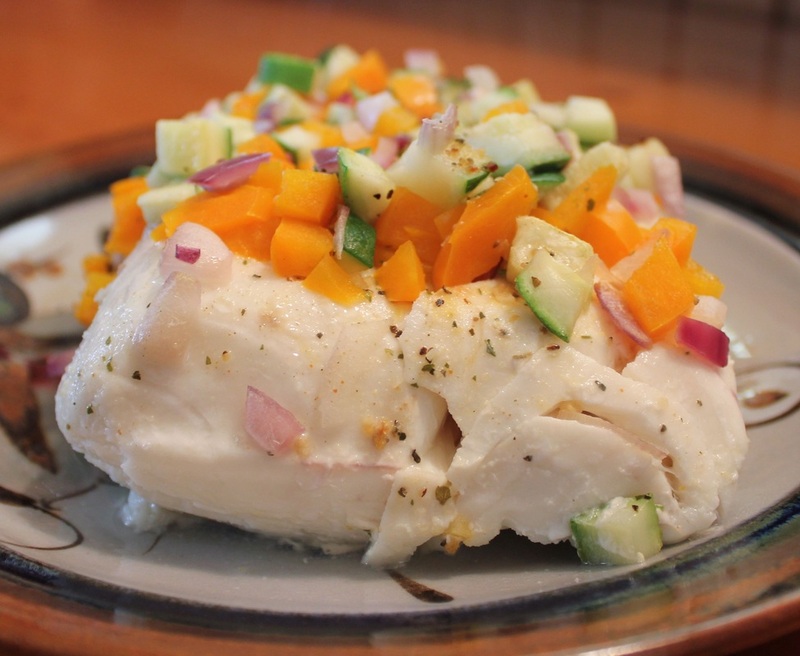 Arrange the vegetables and garlic on top and around the halibut. Sprinkle the rest of the seasoning over the vegetables. Cover the fish with foil and bake for 30 minutes or until done.